A successful foursome at last year’s Golf Classic. 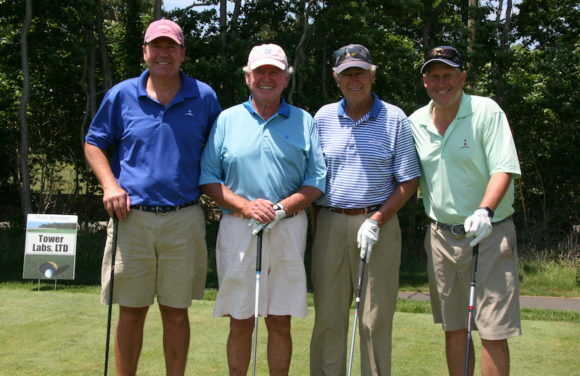 AREAWIDE — On Monday, June 12, The Country School will host its Tee Off for Scholarship Golf Classic at the Pine Orchard Yacht and Country Club. Proceeds will go to the Founders’ Promise Fund for Scholarship at the school. This event is open to the public. Since 2012 The Country School Golf Classic has raised over $100,000 for the Founders’ Promise Fund (FPF) for Scholarship. This investment in a child’s future awards need-based scholarships to a wide range of students. Established in 2006 by Allee and Jeff ‘61 Burt P ‘00, ‘03 and their family to honor The Country School’s founders and their desire to help all children reach their full potential, the FPF for Scholarship has helped 173 unique students in the past decade, awarding more than $4.6 million dollars during this time. This year’s event offers the chance to win a Mercedes with a hole-in-one. Don’t have the best drive? Don’t worry, there will also be a live and silent auction as well as on-the-course prizes so you too can go home a winner or simply join us for dinner at the club. Founded in 1955, The Country School serves 200 students in PreSchool-Grade 8 on its 23-acre campus in Madison. The Country School is committed to active, hands-on learning and a vigorous curriculum that engages the whole child. Signature programs such as Elmore Leadership, Public Speaking, STEAM, and Outdoor Education help prepare students for success in high school and beyond. Learn more at www.thecountryschool.org.